WE HAD no plans of watching the animated movie, “Trolls”, but all of our five grandchildren wanted to see it, so off we went to watch it with them and it turns out to be a pleasant surprise of a musical using old familiar songs like “”The Sound of Silence”,”I’m Coming Out”, “Total Eclipse of the Heart” and “True Colors” combined with some new compositions. “Trolls” today mean internet meanies who bash everyone but they used to be known as cute long haired dolls from the recent past. 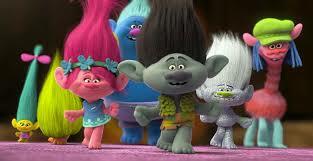 In the movie, the tiny Trolls are by nature happy and positive creatures. They just want to sing, dance, hug and always look at the bright side of things. In contrast, their much bigger enemies are the ogre-like Bergens, who are always feeling sad and miserable. For them, to be happy is to eat a yummy Troll in their holiday called Trollstice. On this special day, the Bergen’s Prince Gristle (Christopher Mintz Plasse) is supposed to eat his first Troll, Princess Poppy (Anna Kendrick). But Poppy is able to escape and because of this, the Bergen King (John Cleese), punishes their Chef (Christine Baranski). The Trolls find a new secret home in the wilderness. After 20 years, the cheerful Poppy holds a big party complete with fireworks, much against the advice of the grumpy party pooper, Branch (Justin Timberlake), who believes the Bergens will eventually locate them, so he has built his own secret bunker where he can hide safely. Chef sees the Trolls’ fireworks and is able to discover their hiding place. She scoops up a bunch of Trolls and takes them away back to the Bergens to be cooked and eaten later. It becomes Poppy’s mission to rescue the captured Trolls along with some friends and later, Branch himself who joins and helps them grudgingly. Directors Mike Mitchell and Walt Dohrn succeed in coming up with a charming animated film with vibrant characters and sprightly feet-tapping, musical numbers. It spouses a simplistic philosophy of ‘Don’t worry, be happy’ and not getting you own happiness at the expense of others. You have to find happiness inside of yourself and not elsewhere, which is a great lesson for kid viewers to remember. They’ve also created a very colorful world with great animation work with great voice acting led by Justin and Anna Kendrick who’s really better heard than seen. 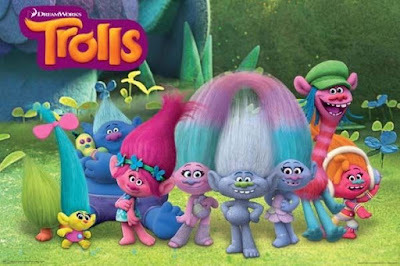 The Trolls really look lovable with their magical combed up hair. Poppy’s scrapbooks are a delight to watch, along with the songs of Lionel Richie, Cyndi Lauper, Simon & Garfunkel, Mama Cass, etc. Also cute is the Cinderella-like story of the lovesick scullery maid, Bridget (Zooey Deschanel, who manages to elicit genuine pathos in the role), who the Trolls help to undergo a transformation and make over so that Prince Gristle will fall in love with her with her cute disco skates, not glass slippers. Our advice is for Americans in these dark and dour times who feel sad that Trump won in their elections to watch “Trolls” to help entertain them and lift up their spirits. Just as the message of Justin’s song says: “Can’t Stop the Feeling”. Our grandchildren were really bouncing and laughing in their seats and we’re glad we watched it with them. If you don’t find it funny, you must be a Bergen yourself.